What is your Brickset Piece / Set / Minifig counts? 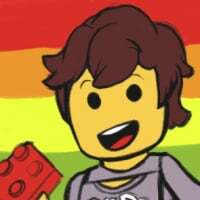 I am just interested in how much you guys have acquired that you have categorized on Brickset. @Huw What proportion of your collection do you have on display? For me most of my sets were bought from 2012 onwards, so about 4 to 5 years worth. Around 2400 sets, 6500 minifigures (sets + loose), 791K bricks (sets + spare + loose). 1781 sets, 4220 minifigures and 429546 pieces, most of which has been acquired since 2008. I probably have about as many parts as that again though, from what I've bought loose or from Bricklink. 260 sets, 483 minifigs, 51441 parts. According to Rebrickable I also have approx 22500 loose parts. 236 sets, 362 minifigs, 27,009 parts. There must be a good few thousand uncatalogued parts and minifigs, though, from charity shop bulk lots, so I'd guess about 30K parts and 380 minifigs, conservatively. I never had a Dark Age in terms of losing interest, but there was about a decade in which I didn't buy very much, so we might say this is, give or take, 25 years' worth of collecting, as a child and an adult. AFOL since Dec 2014 and now have 221 sets, 422 minifigs and 51154 parts, but the part list is going to be a bit higher, due to Bricklinked extras. You own 173 items, 166 different. We have piece counts for 166 of them. You own 49826 pieces. The above includes quite a few CMFs which are annoyingly counted as sets. You own 1690 items, 1527 different. We have piece counts for 1446 of them. You own 277773 pieces. xwingpilot, about 1-2%: 50 sets or so. The rest have either been assimilated into my parts boxes or kept separate in zip-lock bags if I think I'm likely to want to build it again. Practically a third is on display. Since 2010: 78 sets 345 minifigs 33878 pieces. I'll usually have around 20% on display, which rotates. 694 sets, 1049 minifigs, 130,990 pieces. I suspect that the actual numbers are closer to 1000 minifigs and 140,000 pieces that I have accumulated over the last 18 years. 573 sets, 1120 minifigs and 163,792 pieces. I probably have at least 10k more loose pieces that have not been inventoried. Most of this is from the last 10 years and in particular the last few years. My dad sadly gave away a ton of classic space, pirate, city and train stuff I had from when I was a kid (80s/90s) when I went off to college, none of that is obviously included. You own 112 items, 112 different. So, the average part per set is about 540. Don't know which four sets are "countless" but I'm presuming it won't affect the average much. 711 sets (not including doubles, mostly minifigs, which I just can't be bothered to keep track of), 1946 minifigs, and 192813 pieces. That's honestly a lot more minifigs that I was expecting, but I suppose now I think about it the way so many are packed into sets as drivers/crew/inhabitants/whatever; it does kind of camouflage the raw quantity of them. Interesting. All of the childhood collection survives, though disassembled in storage bins. When I started collecting as an AFOL I bought a lot of sets just for fun, which later got dismantled - the dwarves vs orcs Castle sets, Mars Mission, Space Police, Power Miners, Atlantis, lots of Bionicle - but I still have my favourites from those lines in one piece. Very few Star Wars sets got dismantled though, and in recent years I've rarely bought anything I didn't intend to have on the shelves. You own 458 items, 443 different. We have piece counts for 436 of them. You own 137734 pieces. I have tons of duplicate Collectable Minifigures and several of the free polybags that aren't catalogued... and possibly some others. And really heavy weights haven't weighted in yet. Brickset says I have 1994 sets, 1941 different (which is not accurate, as I would log sets if they weren't unique), 440019 pieces and 4566 minifigures. I've got more sets that are unique and a couple of duplicates. I've got a about 150 additional minifigures (mostly red soldiers). I have no idea how many additional pieces I've got, but it's at least 20000. 597 sets, 1327 minifigures, 171,063 parts. probably another 20-30K in parts from Bricklink and bulk buys for mocs as well. I've had 17 years as an AFOL (since Star Wars release in 99) - but to be fair have been collecting for 30y+ since I was as a kid as I have virtually all my Classic Space, Pirates and Town sets from then. My Brickset total says 2999 sets, 7450 minifigs (3,200+ unique) and about 890,000 pieces. I know I have another 80,000 loose and catalogued parts and a few buckets more waiting to be (or may never be) sorted. ok make that 598 sets. Needed a little something to boost up to free shipping threshold so grabbed some more train track. You own 920 items, 618 different. We have piece counts for 607 of them. You own 228382 pieces. How do you see how many unique pieces you have? If you go here: http://brickset.com/mycollection it's in the Sets Owned column on the left. Oh yea I saw that one for sets. Is there a way to see how many unique Lego pieces you have? 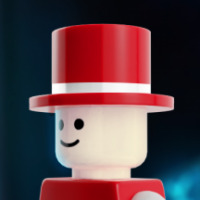 Not sure Brickset had this feature or not but you can create an account at rebrickable.com and sync your brickset database to it, then you can see the data there. For my case I had 8116 unique Lego parts out of a total of 17477 unique parts produced by TLG. Have you enabled the main site so it shows sets, minifig and parts on the home page? If you have you can click on the parts link which will then display your parts and how many of each part you have. One thing to note though is that when enabling this feature there is a disclaimer stating that the parts for minifigs may be inaccurate as Lego do not provide parts lists for them, so providing you ok with the odd discrepancy it's a good way to see what parts are in your sets. If you haven't enabled it, click on your name on the main page, then click on general preferences, the check the box next to enable parts. Doesn't come up straight away but will come up eventually. You own 142 items, 137 different. We have piece counts for 137 of them. You own 36972 pieces. though I don't think I'm up to date, and I don't add the sets I've never built yet, so I probably have close to 10000 additionnal pieces. I think I'm getting short-changed on keychains. It would appear they do not count as pieces. You can't compare the set counts directly. You can mark your ownership for a complete minifigures series, than it counts for one set. Or you can mark your ownership for every single figure of a series, than the setcount is 16. A chance encounter with the Lego Store in Cardiff (UK) back in 2015, followed by a decision to buy myself something totally different that Christmas, brought me out of my dark age. Incidently, I bought the Death Star (10188) that Christmas which I have yet to open! Mainly due to the many, many other sets I bought soon after that! 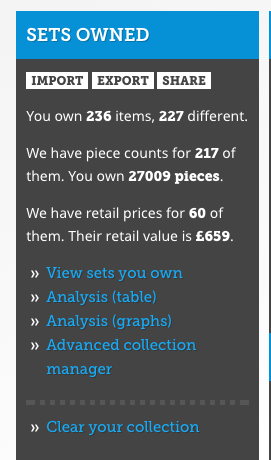 You own 628 items, 548 different. We have piece counts for 518 of them. You own 174934 pieces. The minifig count is probably double what I acually have since I track them as individually minifigs. It has only taken me 16 months to acquire that lot and I'm quickly running out of space. I am hopying the impulse to buy more Lego will soon abate but it hasn't so far! You own 4837 items, 2163 different. We have piece counts for 1944 of them. You own 619756 pieces. Indeed, I add the CMF as set of 16, even if I bought a whole box will just add as 2 or 3 sets and ignore the extras. I am blaming this all on 2 of my grandsons, who made building Legos look so easy and like so much fun. :-) And Legos are all of that and so much more. I got my first set in 2001 (when I was 3! ), and since then I've collected 888 sets, 1345 minifigs and 87680 pieces. That piece count is just from the sets I own mind, I've got a ton o' loose pieces lying around too. Luckily the past 2 months I hardly bought anything as my wishlist is getting smaller and smaller and the final missing sets I want to acquire are rarer and more expensive. Plus Lego's lackluster sets this year have made it easy for me to not buy any of them. I own 561 items; of which 449 are different. BL has piece counts for 391 items I own, which counts as 63,467 pieces. Also, I own 822 minifigs. The part count doesn't include all the bricks that I have bought from the Pick-A-Brick Wall or from Shop.Lego. Mine is far from accurate- I have easily 4-5x that in job lots I need to sort through. 259 sets of which 221 are different. Minifigures 233 (but this does not seem to count Nexo Knights cover mounts and I have a few random people as well).